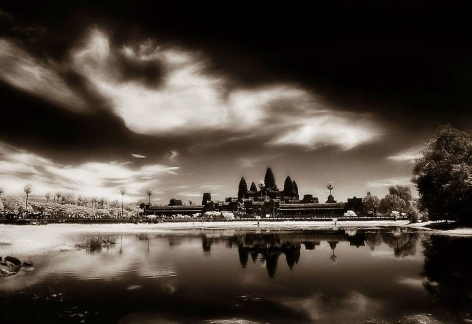 American photographer John McDermott will exhibit a collection of monochromatic photographs from his series Elegy: Reflections on Angkor, a study of the ancient stone temple ruins in Cambodia. The forthcoming exhibit follows a successful showing of McDermott’s work at the Sundaram Tagore Gallery in Beverly Hills in February. This will be the first exhibition of these works in New York. 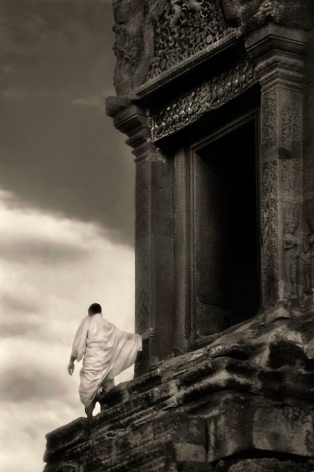 John McDermott, who lives in Siem Reap, Cambodia, will be present during the opening reception on June 9. The hardbound book that accompanies this exhibit has recently been selected as an editor’s pick on Oprah.com, and will be available. 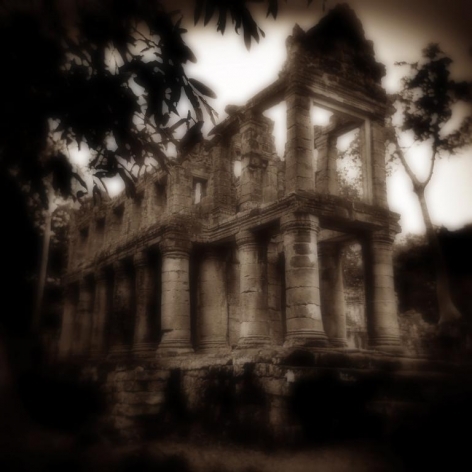 Hailed as the Ansel Adams of Angkor by The New York Times, McDermott began photographing Angkor in 1995 when he traveled there to witness a total eclipse of the sun. This unique visual experience—watching the surreal light of the eclipse wash over the ruins—inspired a long-term photography project aimed at preserving a vanishing vision of the temples as long-slumbering ruins being overtaken by jungle, and entwined with village life. In the mid-1990s, when McDermott first visited Cambodia, the country was still recovering from its dark period of civil war and genocide. While visiting again in 2000, McDermott realized that the political changes then opening up the country would also lead to an increase in international tourism. He set out to create a comprehensive portrait of the temples and their surroundings in a timeless, evocative style that would mirror the dark, mysterious spirit of a place that has little recorded history other than the bas-relief carvings that cover the stones. 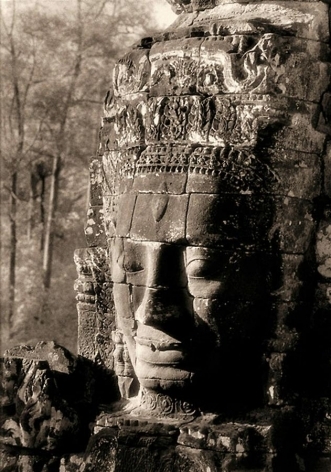 The Angkorian Empire flourished from the 9th through the 14th centuries, at which time they were virtually abandoned. The French explorer Henri Mouhot reencountered the ancient site in the 19th century, introducing them to Western eyes, and declared that these temples were “the work of giants.” The temples survived twentieth century war and internal strife. Since 2000 they have welcomed an increasing number of international tourists. Some two million people are expected to visit this year. McDermott’s images were all made before this major influx of tourism. Since then, international attention has forced the temples into a new incarnation as a high-profile tourist destination rather than a remote jungle ruin. In fact, many of the scenes McDermott captured in his photographs are no longer visible due to changes in infrastructure and restoration efforts. When viewed as a body of work, McDermott’s photographs of Angkor reveal a moody, surrealistic world redolent with the mysterious spirit one encounters when visiting. To create his vision, McDermott uses specialized black and white film and strong darkroom interpretation. 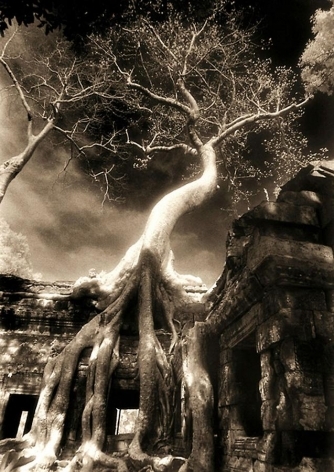 His Angkor series includes both sepia-toned silver gelatin prints and archival pigment ink prints. McDermott’s photography has appeared in numerous publications, including The New York Times, Time, Newsweek, and The International Herald Tribune. His book was recently selected as an editor’s choice by Oprah.com. 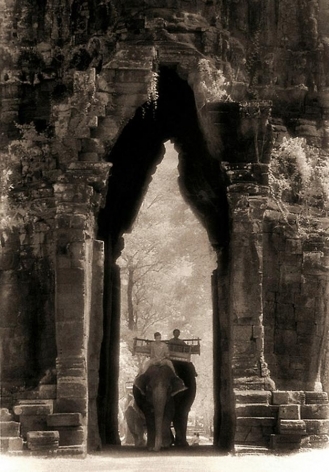 His photographs are on display as part of the permanent collection in the National Museum in Phnom Penh, and are held in private collections around the world. Following the New York exhibition at the Sundaram Tagore Gallery, McDermott will spend two months as an Artist-In-Residence in Bali, where he plans to begin a new photography project exploring the relationship between centuries-old holy places and the everyday Balinese practices that keep them alive.